Pamplin Media Group - Form over function? 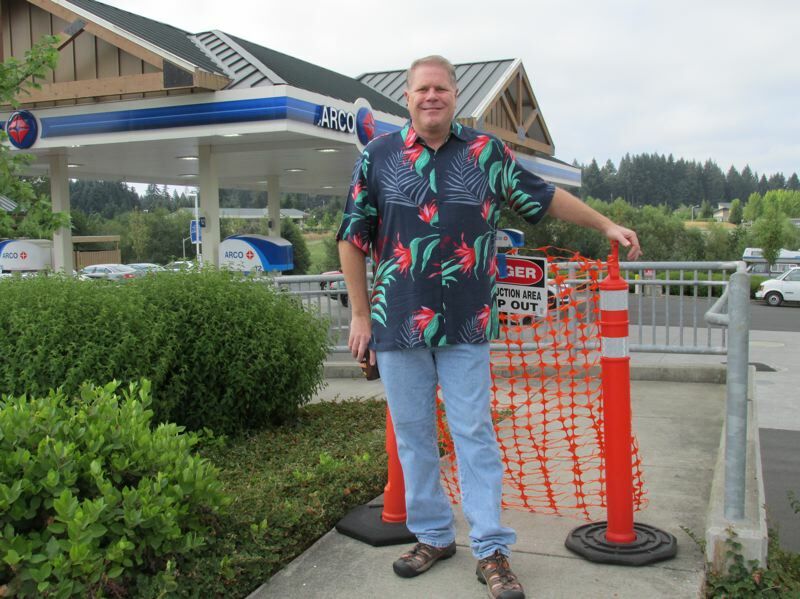 Most anyone who pulls into the ARCO fueling station and AM/PM convenience store at Highway 26 and Champion Way probably notices an attractive, inviting travel facility. It's likely that far fewer take time to scrutinize its detailed features and amenities: Meticulous landscaping. Windows galore. A smooth-surfaced pedestrian ramp. Wood and stone exterior trimming. Even a small but fetching "civic area" complete with benches, plants and bicycle parking. Mark Benson, 56, the facility's co-owner, hopes those buying gas or grabbing snacks, sodas or smokes at least occasionally notice and appreciate these special touches. After all, the cost to design and add them ran him and business partner Sanford Jones about $400,000 above what they planned to spend on the development, which was completed in 2011. Amenity- and safety-based requirements imposed upon them by city of Sandy and ODOT officials — including demands the developers consider excessive, unnecessary and not always clearly expressed when they initiated their proposal — cost the partners time as well as money. "It was a very burdensome process," Benson said. "The sad part is we had to go through a conditional-use permit to get (the AM/PM store) out there. It held us up six months. A huge amount of legal fees and (other expenses) went into that." Jones, an Arizona resident who sold the Alpine Village Apartments in Sandy in 2014, heartily concurred. "(The city) was terribly business unfriendly, let's put it that way," he said. "They required extraordinary things to meet their 'Sandy Style' that were very expensive. Some are useless, frankly. We spent a considerable amount of money for a handicap (accessible) ramp (to Highway 26). In five years, the ramp has not been used. They required windows into a storage area, and landscaping so extensive it essentially hides the gas station. That was only the beginning." The partners would just as soon put the frustrating experience behind them. However, the ARCO station, with limited access from westbound traffic, has yet to live up to their revenue projections. Benson, meanwhile — this time on his own — wants to develop a vacant parcel adjacent to the ARCO into a storage-unit facility. He filed an application with the city's Planning Division in late September. The city has 30 days to review the proposal. Based on his prior experiences working with the city, Benson is, to say the least, a bit apprehensive. Noting he has already spent more than $150,000 just to reach the initial phase of the development process, Benson questions planning requirements for the storage facility — many under the umbrella of the mountain village-oriented "Sandy Style": heavy timber trusses above entrances, terraced planters, false decorative windows, "split-face" rock veneer and other adornments. "The Sandy Style is requiring that the buildings have windows, rock facade, internal landscaping and HardiePlank (siding)," Benson observed. "All these elements add to the cost of the building … My architect has been pulling his hair out. It's virtually impossible to design what they've required us to do. "Industrial Way is a dead end road, and we are forced to place all this decoration, which is not beneficial to the consumer," he added. "I'm not building what I want, not what the market wants, but want the city wants." Sandy City Manager Kim Yamashita said Benson, who engaged in weeks of back-and-forth with city officials before submitting his application, will likely have options once the Planning Commission reviews the official application. "He can ask for a variance on anything that doesn't meet code," Yamashita noted. "(The commission) told him they can see where the (storage) project wasn't really conceived of when Sandy Style was written." Acknowledging that planning directors have different interpretive styles, Yamashita is confident the city has found a workable balance between enforcing existing codes and working to accommodate developers' needs and cost limitations. "We have worked toward changing some things," she said. "Since Kelly (O'Neill's) installation as planning director, we've had conversations, and he feels the same way I do. If there's something (a developer can't fulfill), we'll provide options, other ways to approach the project … We endeavor to work with whoever and not say a flat 'No' and leave it at that. The people who end up unhappy are usually folks not used to developing." 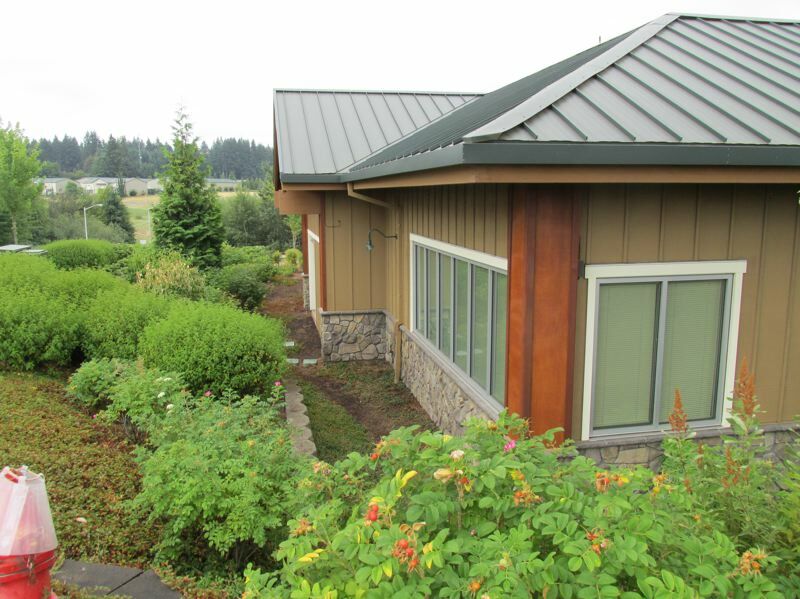 Yamashita, who previously served as Sandy's police chief, recalled her own experience when the current police station on Highway 26 was in the design phase as sharing similarities with Benson's latest proposal. "We had to create a fake box window (to not violate security measures)," she said. "We were granted some variances. We couldn't skip the window requirement, so we negotiated for a false window. So it applies to everyone — even the city." Economic Development Manager David Snider said although Benson's property, some of which the developer is selling for a proposed Tractor Supply outlet, is in a "gateway" area at the city's western edge, a storage unit facility would be a viable addition to the vacant land. "From an economic development perspective, the city doesn't pick winners and losers," he noted. "We don't care what is built there, but that something is built there (that serves city residents)." And from his perspective, there's always room for compromise. "We would much rather work with any business to obtain compliance than to force compliance," he said. In an instance involving a similar business to what Benson is proposing, Stow-A-Way Mini Storage on Ruben Lane, the city is doing the latter. One of Benson's complaints as he's prepared his planning application, is that Stow-A-Way's addition of 24 modular storage containers in 2017 did not follow the same requirements and guidelines. "(Stow-A-Way) is a good competitor. There's nothing wrong with that. But they brought in modular storage units and put them in place with no permitting," Benson said in July. "If I don't follow the rules, I am penalized. I'm about to spend millions, but someone else (does a similar project) there are no permits and no fines." The city recently has taken action to bring Stow-A-Way, which is zoned differently (Light Industrial or I-2) than Benson's property (Industrial Park, or I-1) into compliance. "The owner of Stow Away (Christopher Warnock) installed the non-permitted structures without ever contacting us," noted Kelly O'Neill Jr., Sandy's planning and building director. "We observed the non-permitted structures on (website) Google Earth while looking at another development proposal on land nearby." As of Oct. 1, Stow-A-Way had applied for a design review with what O'Neill said were a number of variance requests and design deviations. "We are checking the application for completeness in accordance with ORS and hope to move forward with the application processing soon," he said. 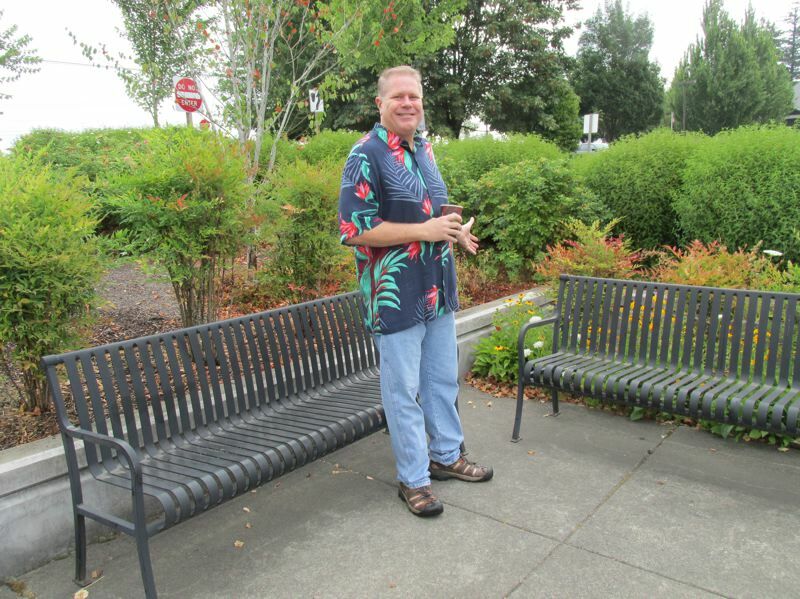 Brian Patterson, president of the Sandy Area Chamber of Commerce, said while Sandy Style requirements are slowly improving the city's look, he understands the frustrations of developers like Benson. "I do think it's made a mark," he said of Sandy Style. "I've spoken with a lot of people I know don't live in Sandy who acknowledge ... it looks like a mountain town. But I understand (Benson's) frustration. It does seem like a deterrent, if everybody goes through that (expense)." 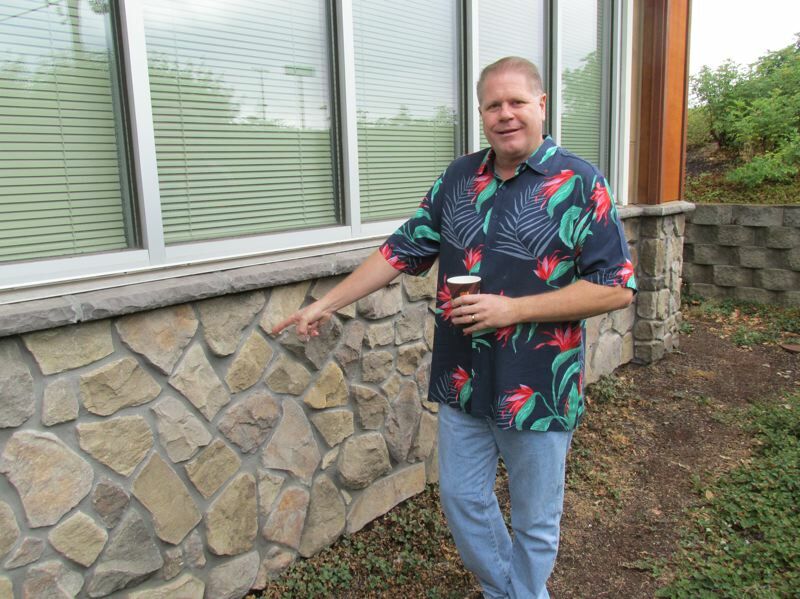 Benson, a former Camas, Wash., resident who now resides in Hawaii, brings what he describes as a successful record as an auto dealer and property developer in multiple states to the latest project. Earlier plans for his remaining acreage off Champion Way and Industrial Way ranged from a Toyota dealership to a brew pub. However, he claims slow-moving bureaucracy played a role in both proposals faltering. 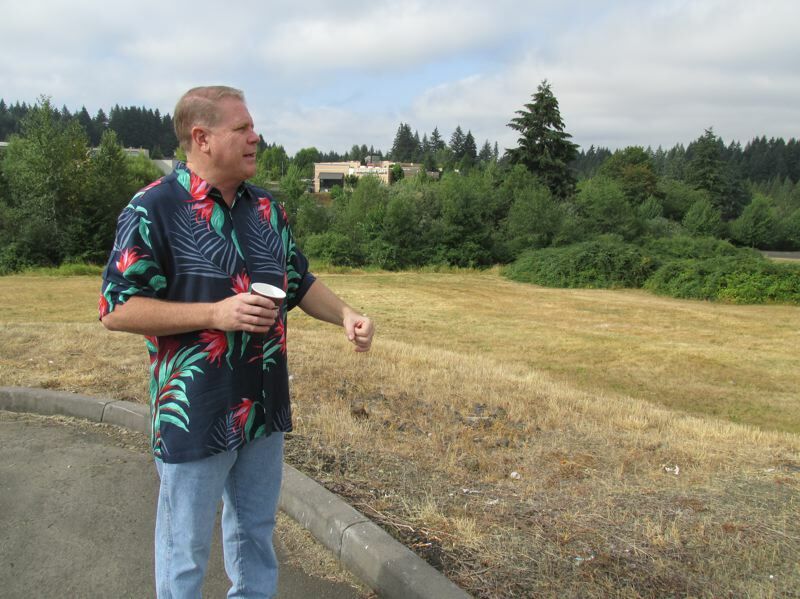 Admitting storage units are not as appealing as what he originally had in mind, Benson said he would settle for any steady, viable business that — along with the pending Tractor Supply proposal next door — would help drive traffic to the ARCO-AM/PM complex. "I would like that lot to be developed as soon as possible," he said. For now, Benson will wait out the planning process and hope the due diligence he's exercised in recent months will make this go-around with the city easier — and less costly — than his last. "I do understand," he said. "I've done it. I've been successful. The difference is I haven't been micromanaged to such a degree."